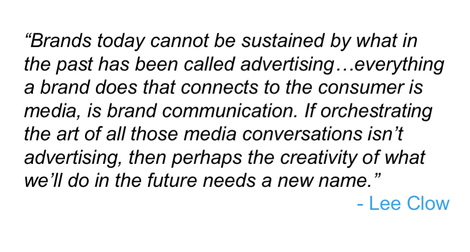 Through all of the rambling that was the post titled, The Future of Advertising is Design, Linda was kind enough to leave a link to a post she put together in the comments which contained the above quote from the venerable Mr. Lee Clow. I have always intended to do a shorter follow-up post to clean that mess up and this quote gave me the perfect lead-in. What I intended to get at, but derailed with tangents, is that based on what Mr. Clow is talking about above - that what we do now (at least those of us who are to survive in this industry) is far bigger than what in the past has been called advertising - we have to think bigger than advertising at the beginning of creating ideas. Where most ad agencies are getting into trouble, at least in my best guess, is that they are starting with looking at reaching the client's objective/goal by asking, "What's the ad campaign we need to create to solve this?" Or, "What's the message we need to tell people that will solve this?" If your approach is to start by assuming it's an ad, or starting by assuming the answer is to tell people something, then you're going to miss significant opportunities and as the quote above says, your client's brand will not be able to survive against others taking a bigger picture approach. This is where the link to design came in. I didn't mean design will become advertising or advertising will become design. I simply meant that as an industry, we need to bring design thinking into the process to help us think bigger than advertising. That's all. For now at least... Ha! *For the record, we can plug "digital agency" into this equation too. If a digital shop is only thinking about how to best solve their clients' problems with web/digital solutions, they're going to quickly end up in the same situation. The only thing keeping them safe right now is that what's going on in the digital arena has everyone excited and so they're not taking the same heat as the traditional ad shops. Once the shine wears off the penny, they'll be hearing the same song. Follow-up Note/Preface: This post kind of rambles and roams. It's not well constructed and thought out. I generally don't post "streaming thoughts" like this, but I felt like I should start getting this stuff out in the open and written down more instead of continuing to hold it in the back of my head until it's exactly how I want to say it. It's clear from some of the initial comments that I didn't get at what I am aiming to yet. At least not broadly. We'll get there. I promise. Thankfully, the comments that are being left are helping me sort through this further and see where it's falling apart. You're helping me find the right way to articulate it. So, thank you to each of you who has taken time to leave a remark, a thought, a link and/or a note. Please continue to share links, thoughts and challenges/questions as it is going to make this better in the end. Came across this just now which led me to this and this. I'm putting Brian Collins' quote here and sharing it as it relates directly to something I've been thinking about for quite some time now. A couple of those thoughts bubbled up in the comments of a post on Logic + Emotion recently. I guess it's probably time to just post some of them here instead of continuing to wait to write up something more "fully baked." Advertising creates problems. Design solves them. Design solves the problems advertising creates. Most advertising as it exists today creates problems. Everyone is claiming to be the best, or better, or the fastest, or the newest... and on, and on, and on. Thousands of ads yelling the same basic message for thousands of products. This creates confusion for people. Confusion is a problem. People generally don't like problems. To counter this, we've created filters to block out all the problems we don't need to deal with. To get rid of the problem for the things we do want or need, we turn to our families, friends and co-workers to see what they think or know from experience. We also turn to the web to look up more information to see what several people, including experts and complete strangers, are saying so that we can find out which one really is the best for what we need. We seek the truth, or as close as we can get to it at least, to clear up the confusion. What does this mean for your ad? Simply put, if your ad doesn't match what these people say, you're probably not going to fare so well. Design on the other hand, doesn't try to claim anything, Design doesn't talk. Design, well, it just does. Design sees a problem someone has with something they're using and works to solve it. By making things better or easier or more useful, etc., you create your own advertising. The person who uses the product or service tells others about it because you just made their life a little better. That confused person above, the one who saw your ad... They're asking the person who is using your competitors redesigned "X" what the truth is and the person using your competitor's "X" has something real to show them and tell them about. Meanwhile, you've got the same old "Y" and a loud ad that creates problems. That doesn't sound like a fun situation if you ask me. The way I've been articulating it, but I don't know if it's the best way of saying it, is, "We're no longer in the business of creating ads. We're in the business of creating experiences." 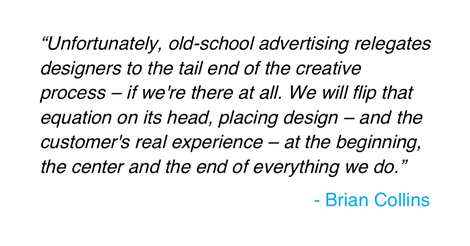 What this means for agencies is exactly what Brian Collins is talking about. We've got to re-think the process of how we solve problems for our clients. Instead of starting with "what's the main idea we need to communicate,' we need to start with "what is the experience we need to create to change behavior?" As a very wise man keeps pointing out, telling people things doesn't change behavior. Getting them to actually do things does. What this means for advertising is that your ad needs to draw people into the experience instead of telling people you're the best. Make the ad do something, not just say something. The most recent iPhone ads are good examples here - showing what the phone can do to help make life easier instead of trying to tell you the iPhone is the best phone on the market and/or will make you look cool. Another great example is the TV spot for the new Dyson Ball vacuum where James Dyson demonstrates the "steering" problem with conventional vacuum cleaners due to their being on four wheels that are only able to roll forwards and backwards and then showing his solution, putting the vacuum cleaner on a ball so it can pivot on a dime. (Tried to find the spot so I wouldn't have to describe it, but couldn't. Sorry. If you know where it is, please let me know and I'll put it here instead.) Linked above (TV Spot) now, thanks to Camilla from Dyson sharing the link in the comments. Another good example of this is BMW. For years they've been all about selling the ultimate driving experience. This begins with the car and how they design and engineer every aspect of it. They think about the driver and what they can do to make driving a BMW a truly special experience. They then use the advertising to give you a hint at what that experience is like. BMW Films took this to an entirely new level. All three of these examples put the user experience first and foremost and then they build the advertising around that experience. Sure, it helps that all three of these products have an inherent "coolness" factor built into them, (I never thought I'd be calling a vacuum cool, but the Dyson kind of is...) but as the presentation I posted touched on, you don't have to have a cool product to create a great experience around the product. You can do things with your marketing that add value to the product or service, making a better overall experience for people. Anyway, the point is that as an industry, we have to stop thinking about things like traditional advertising people. We need to start thinking about things like designers, engineers, architects and the like. We need to think about the action we want people to take and what will be required to make that action happen. We can't just think about what we want to tell people. Odds are, telling someone to do something won't be effective alone, if at all. Today's congested media landscape requires a lot more than a campaign built on 30-second TV ads with a heavy media buy to create any real change. It's in creating total experiences that we will see success. And with that, I'll stop for now. More to come on this later, I'm sure. I didn't expect it to go as far as it did already. Side note: I don't have time to keep going anyway. I've got to run my Sunday errands now since I'll be going to see Bon Iver tonight when I normally do them. If you haven't heard him and you like Nick Drake, José González and others in that vein, be sure to check him out. He's not exactly like those artists, but if that style/genre of music suits you, then I think you'll like what Justin is doing.